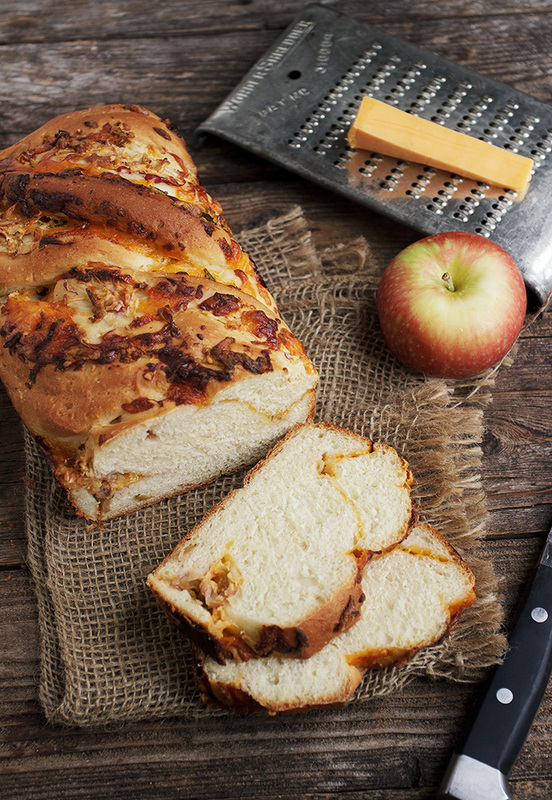 This delicious cheddar apple yeast bread, is infused with a subtle note of apples. Absolutely perfect toasted with butter or try it as a sandwich bread. I absolutely had to share the bread. It was so delicious and just about the perfect thing to enjoy toasted and buttered on these cool Fall days. In fact, it was so great toasted, that I decided I needed to call it toasting bread. There was just something about the warm bread, with both the taste and aroma of warm apple, mixing with the cheddar cheese was utterly addicting. We couldn’t stop eating it. You can start with any kind of apple for this one. Simply peel and shred. As some apples are quite moist, you’ll want to dry them as much as you can, by pressing the shredded apple between paper towel before spreading on the dough. I used simple Fall Macintosh apples for my bread. As for the cheese, use any cheddar you like. The only thing to watch is that you don’t add so much that it over-powers the apples. I kept it a little lighter, since Macintosh apples are lighter in taste. If you were to use something like a Granny Smith, you could probably use a bit more cheese. I found about a packed cup of an old cheddar to be about right. 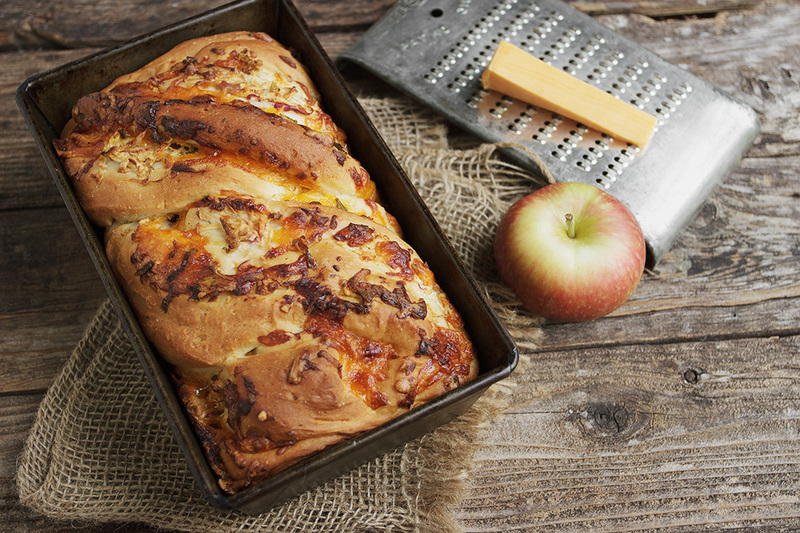 A soft cheddar bread, with the taste and smell of apple baked right in. If your apples are really moist, blot between two sheets of paper towel to remove excess moisture before spreading on dough. 1/2 cup lukewarm water about 95° F.
In a large bowl of the bowl of a stand mixer fitted with a kneading hook, combine 2 cups of the flour, the salt, sugar and instant yeast. Mix to combine. Add the lukewarm water, milk and melted butter or oil. Mix to combine. Begin adding the remaining flour, 1/4 cup at a time, until you have a soft and smooth dough that is moist, but not tacky. Remove dough to a greased bowl, cover with plastic wrap and allow to rise until doubled, 45-60 minutes. Remove dough to a floured surface. Roll in to a rectangle, approximately 12 inches wide by 18 inches long. (*Note: If you shredded apples are really moist, spread onto some paper towel and top with more paper towel to blot up excess moisture, before putting on the dough). Spread the shredded apples over surface, in a single layer, leaving a 1-inch margin on the longest sides (apple should cover dough well in a single layer. You may need to add a bit more). Top with shredded cheese. 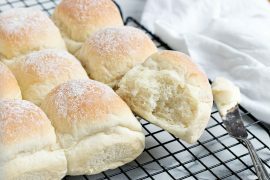 Starting with the long sides, roll the dough jelly-roll style (the best technique here is to lift gently and flop forward), until you reach the end. Pinch seams and ends together. Using a sharp knife, cut down the centre of the roll from one end to the other. Carefully place the two pieces side by side, with the cut side facing up. Pinch together the two pieces of dough at one end. Proceed to braid the two pieces together, by lifting on piece over the other and then repeating a couple of times. Pinch together the other end. Grease a 9×5-inch loaf pan. Using a spatula or a bench scraper, carefully lift the braided dough in to the pan. Spray a piece of plastic wrap with cooking spray and place over top of pan. Allow to rise until dough has risen about an inch above the pan in the centre. Pre-heat oven to 350° F. Once bread has risen, remove plastic wrap. Bake for 30 minutes. Check at 30 minutes and rotate the pan front to back. If bread is already well browned, cover loosely with a piece of aluminum foil and bake an additional 10-15 minutes, until bread is golden brown and sounds hollow when tapped. (Or about 200° F. when tested with a thermometer). Allow bread to cool in the pan for 5 minutes, then run a knife around the edges and remove bread from loaf pan and cool on a cooling rack. Made this today and it turned out great. I loved your recipe and how you give alternatives if you happen to not have bread flour or buttermilk for instance. And I just noticed your serving size adjuster, love it. Glad you found it :) Enjoy! Oh my gosh AMAZING! I love the addition of the cheddar in the apple bread! Definitely a must-make. Omg, THIS bread has me drooling all over the place like a St Bernard puppy! 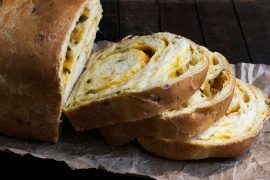 This looks incredibly delicious and the flavors of apple and cheddar paired IN bread is just outstanding! A loaf of this wouldn’t last a second around me… especially toasted! Pinned! So YUM! Cheers! Well, you know I’m going to love this one! Cheddar + apples + carbohydrates = pretty much all my favorite things right there! Oh gosh, I love toasting bread, Jennifer! I can imagine it would also taste great in a sandwich with savoury things! What a terrific idea – I love that you combined cheese and apples – a duo that is close to my heart! Your bread is beautiful and I bet it tastes wonderful. Have a great weekend! I’m imagining a turkey and bacon sandwich on this delicious looking bread. 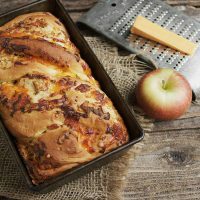 I love the combination of apple and cheddar but never thought to combine them in bread. Thanks Chris and yes, I love to use bread like this in sandwiches. So many great flavours! This bread looks absolutely scrumptious, perfect for fall days! Just made a loaf today. I love your technique for shaping the bread as it always produces gorgeous results. I used three small apples – two Gala apples and one Pink Lady, but we couldn’t taste the apples at all. I used one cup of white cheddar but think the yellow cheddar would make the swirls more obvious. Do you think my cheddar was too strong for the apples? 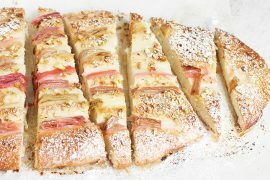 I’m planning to make apple, cheese, bacon paninis with the bread tonight but would love your thoughts on how to ramp up the apple flavor in the bread itself. Hi Jane. Yes, I’m guessing your cheese was sharper than mine. I used a standard grocery store orange ‘old’. The apple in this bread is fairly subtle, so doesn’t take much to over-power it. That said you could also add some grated apple to the dough easily to ramp up the flavor of the apples. Jennifer, this bread looks totally gorgeous! I have had homemade bread on my fall baking list and now I know what one I’ll be trying! LOVE the cheddar cheese & apple combo. Classic! Thanks so much, Marissa. You must try it. The combination is awesome! Literally screamed out loud at my desk at work “GTFO!” THIS LOOKS SO AMAZING. Your swirl breads always look so pretty. I’ve always wanted to try the apple-cheddar combo in my baking but haven’t gotten around to it. This fall I will have to make this!